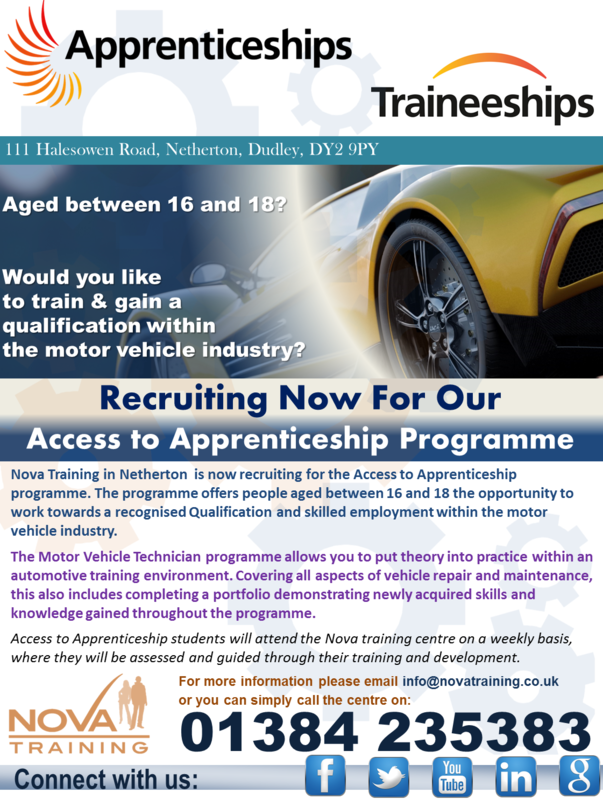 Nova Training Centre in Netherton (Dudley) is now recruiting for the Access to Apprenticeship programme. The programme offers people aged between 16 and 18 the opportunity to work towards a recognised Qualification and skilled employment within the motor vehicle industry. The Motor Vehicle Technician programme allows you to put theory into practice within an automotive training environment. Covering all aspects of vehicle repair and maintenance, this also includes completing a portfolio demonstrating newly acquired skills and knowledge gained throughout the programme. Access to Apprenticeship students will attend the Nova training centre on a weekly basis, where they will be assessed and guided through their training and development.